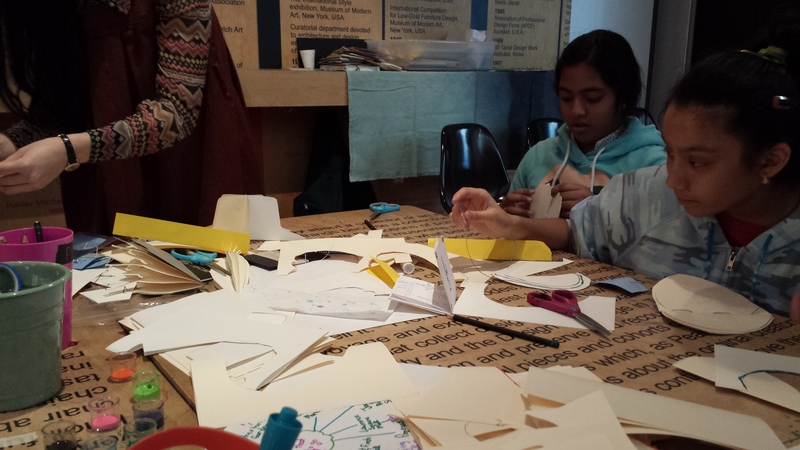 In April, the Village Bloggurls went to the Design Exchange to learn about zine-making and mapping. We took a tour of the fabulous space and learned really interesting things like who the artists were that depicted women in their works (most of them were men). Afterwards, we took a workshop with an illustrator named Andrea Manica who introduced us to her world of zine-making. I really enjoyed making zines with the girls and getting to know Andrea better. We have a lot of girls in our group that are aspiring artists and illustrators, and seeing a woman who is doing it and doing it well is cause for an interview! ‪ ‬My name is Andrea and I am an illustrator, as well as a baker, gardener, babysitter, and friend. I live in Toronto. I seek inspiration from nature and from my wonderful and generous pals – a lot of whom are passionate female artists. I became an artist by creating things! I think that is really the only requirement. My main creative outlet has always been making pictures, be it drawing or painting. As a kid I would watch cartoons and then draw my own versions of them. I’d look at a picture of Garfield and try to get as close as possible to his image – I never ever traced!! I drew every day. Eventually I chose to study illustration at OCAD, but it was not an easy decision, because I never thought art could become a career. I thought that I should study something that would change someone’s life, like medicine. But science and math were not things I excelled in, my true passion was always art! And how could I not have realized sooner, how therapeutic and life-enhancing art is for others AND for myself? I make comics about my life, and I like to draw girls, plants, patterns & creatures. I am interested in promoting feminism and equality. I like the idea of accessible art – making zines that are cheap or free, putting comics on the web, and painting murals in public places. Storytelling is important to me: the stories of others inspire my work, and my work tells personal stories. A zine is short for “magazine,” and you pronounce it like ZEEN. It is a small self-published book. You can create multiple copies of a zine to sell or distribute. 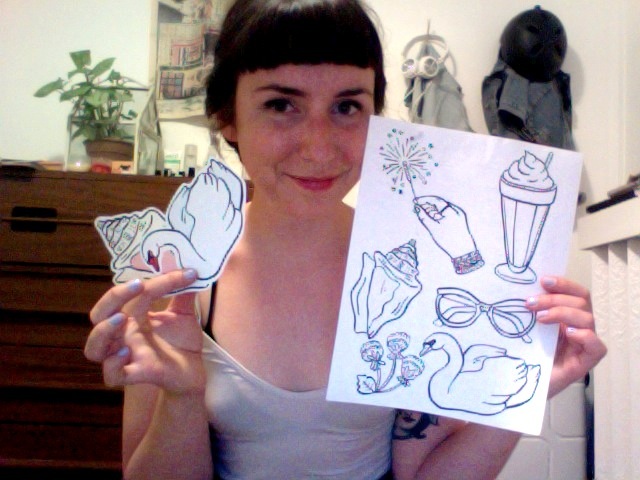 Zines are often photocopied and stapled, but some people screen print, or hand-draw them. They can be bound with string or specially folded. Zines are a fun and affordable way to share writing, pictures and art, and they can be created in so many ways. I think all anyone needs to create art are materials and the freedom to express oneself. Sometimes feeling “not good enough” stops some people from trying in the first place. But really, anyone can create a work of art! It doesn’t have to be beautiful right away, or even at all! Taking time is really important, to work hard and practice. For me, self-doubt became a barrier. I felt that my art would not be important or make a difference. I learned that is best to ignore what others might think & to create for my own entertainment and enjoyment first. It is so important to share your experience of the world. As someone who has been shy to speak, I have always found it easier to express my stories through my drawings. It enables me to be more thoughtful and precise with what I want to tell. To share struggles or joys brings people closer and leads to understanding. I love that idea – that art can free us! Don’t listen to anyone who tells you not to pursue art because it is not “practical.” Who wants to be practical anyway? An insole is practical, and it is smelly and stuck to a foot all day. Never stop drawing, exploring and creating! Seek out people who are doing what you want to be doing, and ask them how they do it. I studied at OCAD, but there are a ton of different art schools throughout Ontario and beyond with great instructors and resources. Attending classes may help you improve your talents as an illustrator, animator, sculptor, or designer. But keep in mind, not all professional artists even went to school! You can see my illustrations at http://www.andreamanica.com, and my comics at cerealwithasmile.blogspot.com. You can even email me at andrea_manica@hotmail.com if you have a question!